A recent issue of Star Magazine humiliated Jessica Simpson with a contemporary version of a public hanging. 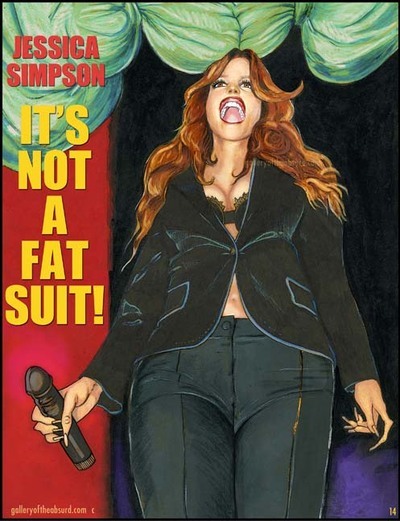 They ran a cover photo of her along with the accompanying headline, It's Not A Fat Suit! Inside the mag, they included a full-page version of the photo with the screaming headline, Hips Don't Lie! The photo was taken at an unflattering angle, and while Jessica didn't really look fat (at least to me) she did look ridiculous. She's up on stage, her mouth is gaping wide open, voluptous double-D cups bust out of her jacket and she's holding a very phallic-looking microphone in her hand. I didn't notice any fat, but it did cross my mind that she looks a lot like a blow-up doll. The photo had a very pornographic look to it and I felt compelled to capture it. Now that I've painted and posted the image, I realize I too am participating in her public hanging. Oh, the humanity. Medium: acrylic on board, digital text. The Jail Bird is squawking mad because she thinks her prison sentence is "cruel and unfair". She refuses to take responsiblity for driving under the influence or for driving with a suspended license. The Jail Bird is very lucky she didn't kill someone when she drunkenly swerved her Mercedes into the In-n-Out Burger drive thru late one night.That would be "cruel and unfair". The Jail Bird believes she's above the law because of "who she is" and continues to blame others for her mistake. The Jail Bird is sure to be extremely unpopular in the Century Regional Detention Facility and will have to watch her back at all times. She faces being preyed upon by "very masculine lesbians" and even worse, won't be allowed to wear makeup or touch up her dark roots. The Jail Bird will spend 45 pensive nights sleeping on a thin stained mattress and a scratchy old wool blanket. I think it will do her a world of good. Medium: graphite on paper, digital color. It's Paris Hilton Celebration Week! Much thanks to half the planet's population for emailing me to do a Paris Hilton in Jail posting. I'm working on one, but it's not quite ready yet. To celebrate Paris Hilton's jail sentence, I'm going sailing out on the beautiful San Francisco Bay today. Champange will be a'flowing and laughter-filled gloating will fill the air. Meanwhile, here's another delightful Jeff Polage Celebrity Pantomime. This time, Jeff has created a stunning likeness of Paris Hilton's crotch. We tried to find a raw chicken that looked more rotten, but the grocery clerk said they only carried fresh chickens. We did this photo shoot in a pool side cabana located at a Beverly Hills hotel and all the tony hotel guests gave us dirty looks as hirsute Jeff walked past everyone carrying a raw chicken and wearing nothing but a towel. It was a good day.